Come worship with us on Easter Sunday with us as we celebrate the Resurrection of our Lord and Savior Jesus the Christ…We hope to see you there! Countdown to summer! Let's get it started off right! Join us for the 4th Annual All-White Party! Dress in ALL WHITE ATTIRE and join your Freedom family in the Freedom Church Fellowship Hall for a fun night with a catered dinner, dancing, and friends! Then remember it all with pictures in our stylish photo booth. Don’t miss it! We’re excited to also host a kids’ party for children ages 1–9 upstairs with yummy pizza and snacks and lots of fun activities hosted by Maryland Teacher Tutors. Please pre-register by MAY 8 using the button below. All families are invited to join us for an Easter Egg Hunt right here at Freedom! Due to inclement weather, all Freedom church services and activities scheduled for Sunday, January 13, 2019 have been cancelled. We look forward to seeing you next Sunday, January 20th. Please be safe! Celebrate Christmas with us at this special evening candlelight service! Featuring Christmas carols and a free gift for every child up to age 16! If you are interested in learning more about Freedom Church and what it means to join our church we invite you to our informational luncheon following the morning service. Lunch will be provided. 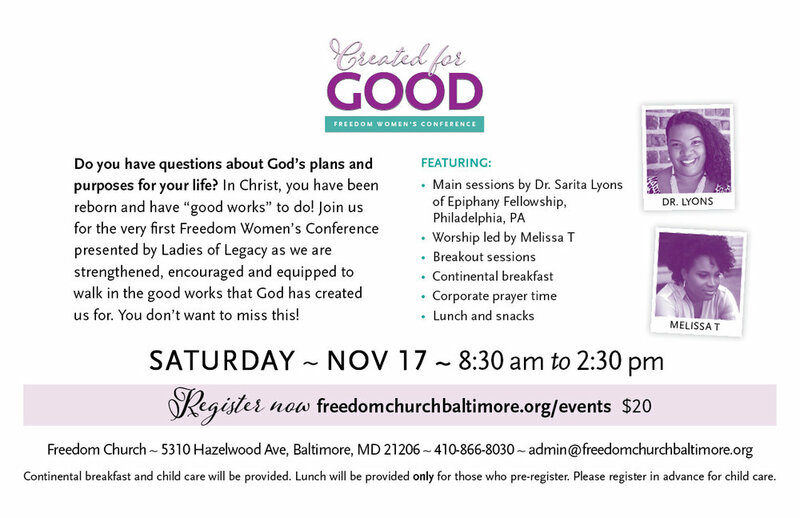 You are invited to attend our very first Freedom Women's Conference presented by Ladies of Legacy! The theme is "Created for Good." Do you have questions about God's plans and purposes for your life? Ephesians 2:10 says, "For we are his workmanship, created in Christ Jesus for good works, which God prepared beforehand, that we should walk in them." We all have been placed on the earth for a purpose. In Christ, you have been reborn and have "good works" to do! Whether you believe you are on track or you're still looking for the track, join us as we are strengthened, encouraged and equipped to walk in the good works that God has created us for. The conference will feature main sessions by Dr. Sarita Lyons of Epiphany Fellowship, Philadelphia, PA, worship led by Melissa T, break out sessions and more! Registration is $20. Continental breakfast and child care will be provided. Lunch is included ONLY for those who pre-register. Please pre-register for child care. Doors open at 8:30 for registration and breakfast. Get dressed up and come by for LOTS of CANDY and Fun House FUN! There will be also be a RAFFLE with BIG prizes! As always, everything is FREE! The Upper Room is a different kind of conference, where prayer is the focus and chief activity. There are many good conferences in America but none of them are dedicated to prayer. The Upper Room conference is going to change that! We believe our greatest need is for God to move in us, our neighborhoods, cities, states and world. If you believe prayer is our primary strategy and our greatest weapon, then you will love the Upper Room conference. We will gather for prayer Friday October 5th, from 7–9 pm. Then we will gather again Saturday, October 6th from 7 am–1:30 pm. The Upper Room conference will consist of worship and messages that inspire us to pray. However, we are committed to spending the majority of our time in prayer. God will hear. God will answer. For more information and to register (for free), visit upperroombaltimore.org. Unfortunately, we have had to cancel this event due to weather. This event has been cancelled due to the weather forecast for Friday, June 22nd. Countdown to summer! Let's get it started off right! Dress in ALL WHITE ATTIRE and join your Freedom family in the Freedom Church Fellowship Hall for a fun night of catered appetizers, lounging, dancing, and friends! Then remember it all with pictures in our stylish photo booth. Don’t miss it! Calling all MEN! Join us at AMF Country Club Lanes - 9020 Pulaski Hwy.,Baltimore, Maryland 21220 - for a time of food, fellowship and FUN! This fellowship is FREE, but we need you to RSVP by clicking HERE! The Baptist Convention of Maryland Delaware and The Banquet Network invite you to the 3rd annual special needs and disability conference. This one-day conference is designed to equip individuals and churches to engage and effectively serve individuals and families with disabilities. 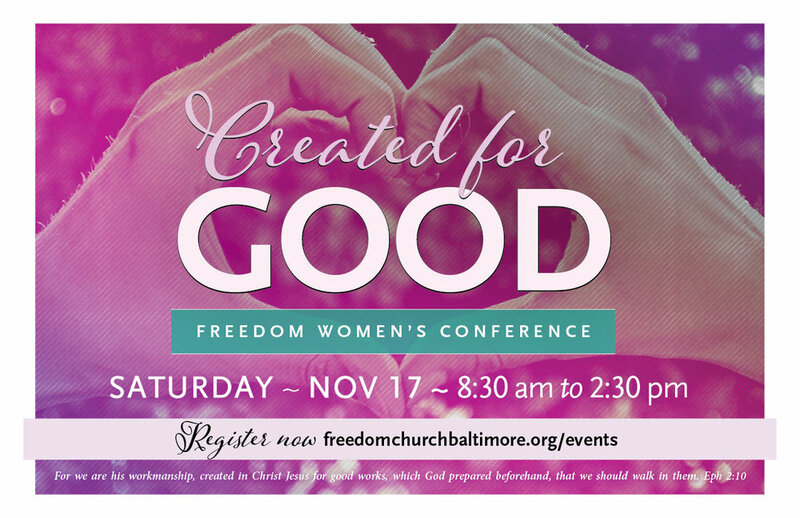 The conference will feature keynote speakers Tom Stolle of the Baptist Convention of Maryland Delaware and Nichole Huggins of “Love in a Different Language" as well as breakout sessions that will allow you to dig deeper into specific topics. Participants will leave equipped with tools and practical directions on the mechanics of how individuals and churches can engage people with disabilities. Lunch is included and childcare is available. If you are interested in attending or serving at this event, contact us at thebanquetnetwork@gmail.com or find out more at thebanquetnetwork.com/conference.